Atlas Guides aka Guthook app is doing a new feature on their blog called, My Trail Story. A couple of weeks ago, Guthook reached out to me and asked if I’d like to be featured. Of course I said yes. Anytime I get to talk or write about my PCT hiking experience is a win for me. Today, Guthook published my trail story on their blog, in it’s entirety! I didn’t know how much they wanted in terms of word count so I just sat down and wrote. They ended up publishing the whole dang thing. Consider yourself warned – it’s a longish read. I not only talk about some of my favorite (and not-so-favorite) hiking experiences, but I also give advice to newbie thru-hikers or those considering becoming a thru-hiker one day. The Guthook app was something I used every single day on the PCT. It was one of my most important tools. Guthook kept me from getting lost. It told me where my next water source would be. It gave me a heads up on tent sites. It even told me how big or small my climbs and descents were for each day. Guthook was instrumental in planning my town stops. I couldn’t imagine hiking the PCT without the Guthook app and will be using the app again this year as I hike the PCT all over again. I’m so happy and honored they wanted to feature my story on their blog. Read: My Trail Story on the Guthook/Atlas Guides blog. 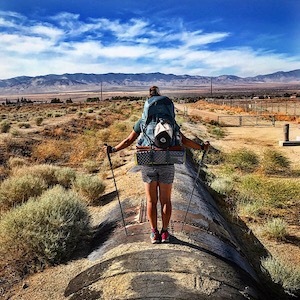 Want to be a Trail Angel for my 2019 PCT Thru-Hike? CLICK HERE to view my trip registry where you can sponsor any of the many trail amenities I’ll need along my hike like root beer, showers, loads of laundry, meals, etc. My 2019 PCT Thru-Hiking Trip Registry is a fun way for generous folks who find joy and inspiration in what I do to be an active part of my PCT thru-hiking experience without having to take a single step . « NoBo vs SoBo PCT Thru-Hiker – What’s The Difference?